Ellen Idler, PhD; William H. Foege, MD, MPH; John Blevins, ThD; and Mimi Kiser, DMin, MPH, all wrote articles for a special section of the American Journal of Public Health on religion and health. The full issue (including links to each author’s article) can be viewed here. Matthew C. Freeman, PhD, MPH, was an author on the article, “Results of a national school-based deworming programme on social-transmitted helminths infections and schistosomiasis in Kenya: 2012-2017,”published in Parasites & Vectors. Kelli A. Komro, PhD, MPH, was an author on the short report, “Increasing adolescent girls’ ability to identify STI-risk characteristics of sexual partners: a pilot study within an alternative disciplinary school,” published in Sexually Transmitted Infections. Thomas Clasen, PhD, was an author on the article, “Comparing trap designs and methods for assessing density of synathropic flies in Odisha, India,” published in Parasites & Vectors. 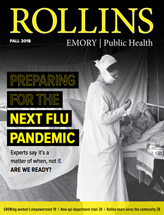 Carla J. Berg, PhD, was an author on the article, “Food insecurity, psychosocial health and academic performance among college and university students in Georgia, USA,” published in Public Health Nutrition. The abstract is available here. Robert A. Bednarczyk, PhD, was an author on the article, “Vaccination perspectives among adolescents and their desired role in the decision-making process,” published in Human Vaccines & Immunotherapeutics. José Binongo, PhD, was an author on the article, “Predicted risk of mortality score predicts 30-day readmission after coronary artery bypass grafting,” published in General Thoracic and Cardiovascular Surgery. Felipe Lobelo, MD, PhD, was an author on the article, “Assessing physical activity, sedentary behavior, and cardiorespiratory fitness in worksite health promotion,” published in American Journal of Health Promotion. Jeffrey M. Switchenko, PhD, was an author on the article, “Residential ambient benzene exposure in the United States and subsequent risk of hematologic malignancies,”published in International Journal of Cancer. Timothy L. Lash, was an author on the article, “Long-term risk of hospitalization among five-year survivors of childhood leukemia in the Nordic countries,” published in Journal of the National Cancer Institute. Vincent C. Marconi, MD, was an author on the article, “Targeting the third ‘90’: introducing the viral load champion,” published in Public Health Action. Benjamin A. Lopman, PhD, was an author on the article, “Birth cohort studies assessing norovirus infection and immunity in young children: a review,” published in Clinical Infectious Diseases. K.M. Venkat Narayan, MD; Shivani A. Patel, PhD, MPH; Solveig A. Cunningham, PhD; and James W. Curran, MD, MPH; authored the article, “Ominous reversal of health gains in the United States: time to rethink research priorities?” published in Annals of Internal Medicine.